New Public Sites walking tours explore the history, design and uses of public spaces in Baltimore and beyond. Public Artist and tour guide Graham Coreil-Allen creatively reinterprets architecture, history, urban design, and art while investigating the negotiable nature of public space. Discover how civic leaders, urban policy, and community movements continue to transform neighborhoods. Hear stories of how regular people are shaping public life through grassroots organizing and civic engagement. Playfully activate enigmatic public space. Secret places, coded paving, environmental engineering, and forgotten monuments all reveal hidden truths. New Public Sites invites you to practice “radical pedestrianism” – traveling by foot through infinite sites of freedom while testing the limits of and redefining public space. 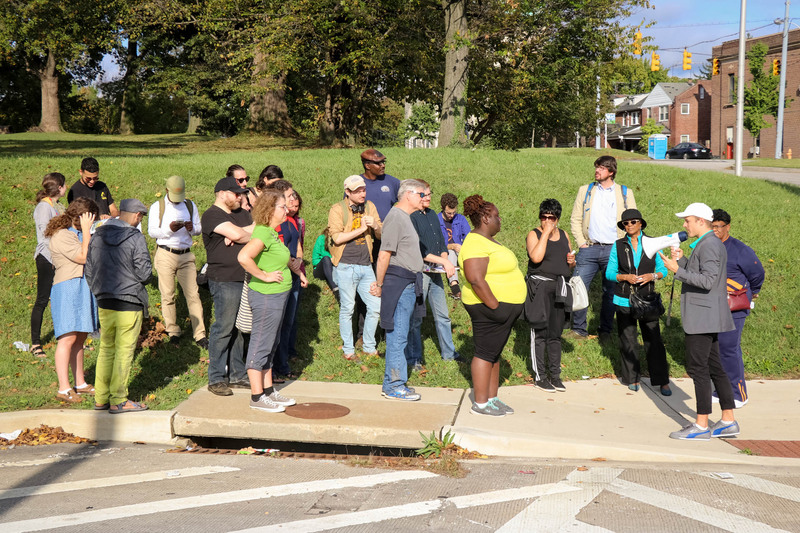 Group tours start at $200 for an existing walk in Baltimore (see here). Custom tours are also available upon request. Click here to contact Graham for more info. New Public Sites is an ongoing series by public artist Graham Coreil-Allen; a Baltimore-based public artist and organizer working with diverse communities to make cities more inclusive and livable through public art, civic engagement, design, and communications. Coreil-Allen received his MFA from Maryland Institute College of Art and has staged public projects and programs for numerous organizations, places, and events both nationally and abroad. Through his creative agency Graham Projects, Coreil-Allen leverages multimedia strategies for meaningful impact, including community engagement, graphic design, project management, web development, social media, and public relations. New Public Sites consist of everyday public spaces existing in one or more of three states: rendered mute by their physical and discursive emptiness, ambiguous due to contextual contradictions of urban design, and/or invisible from a lack of formal architectural framing and practical readability. Newpublicsites.org/sites is the living collection of recent and on-going New Public Sites tours, terms, experiences and ideas derived from our everyday public spaces. The Field Guide to Invisible Sites organizes these public spaces into a system of sites, components, qualities and concepts, indexed and described through maps, terms, definitions, images and videos. The field guide not only represents a system of classification, but also a playful yet serious linguistic intervention into the discourses of architecture and planning. Through invented and appropriated language, this collection of architecture poetry challenges the authority of how public space is represented.